Use Excel's split screen feature to view multiple copies of the same worksheet. Splitting the screen divides the current worksheet vertically and/or horizontally into two or four sections allowing you to see the same or different areas of the worksheet. Note: These instructions apply to Excel versions 2019, 2016, 2013, and Excel for Office 365. Click on the Split icon to divide the screen into four parts. Note: These instructions apply to Excel versions 2019, 2016, 2013, 2010, and Excel for Office 365. You can split the Excel screen into four panes using the Split icon located on the View tab of the ribbon. This option works by adding both horizontal and vertical split bars to the worksheet. Each pane contains a copy of the entire worksheet and the split bars can be manipulated individually or together to allow you to see various rows and columns of data at the same time. The steps below cover how to split the Excel screen both horizontally and vertically using the Split feature. Although data doesn't need to be present for split screens to work, it makes it easier to understand how the feature works if a worksheet containing data is used. Open a worksheet containing a reasonable amount of data or add several rows of data – such as the data seen in the image above – to a worksheet. Remember you can use the fill handle to auto-fill the days of the week and sequential column headings such as Sample1, Sample2 etc. Click Split in the Window group to turn on the split screen feature. Both horizontal and vertical split bars should appear in the middle of the worksheet. In each of the four quadrants created by the split bars should be a copy of the worksheet. There should also be two vertical scrollbars on the right side of the screen and two horizontal scroll bars at the bottom of the screen. Use the scroll bars to move around in each quadrant. Reposition the split bars by clicking on them and dragging them with the mouse. To reduce the number of screens to two, drag one of the two split bars to the top or right side of the screen. For example, to have the screen split horizontally, drag the vertical split bar to the far right or far left of the worksheet, leaving only the horizontal bar to split the screen. Drag both split bars to the edges of the screen; with both bars in this position, the split icon on the ribbon is turned off. 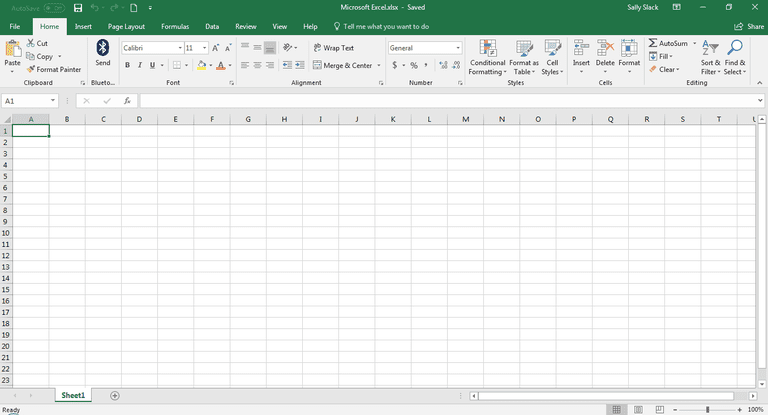 The split box, a second and very popular way of splitting the screen in Excel, was removed by Microsoft starting with Excel 2013. For those using Excel 2010, instructions for using the split box can be found below. The vertical split box is located in the bottom right corner of the Excel screen, between the vertical and horizontal scrollbars. Using the split box rather than the split option located under the View tab allows you to split the screen in one direction only – which is what most users want. Place the mouse pointer over the split box above the vertical scroll bar as shown in the image above. The mouse pointer will change to a double-headed black arrow when you are over the split box. When the mouse pointer changes, click and hold down the left mouse button. A dark horizontal line should appear above row one of the worksheet. Drag the mouse pointer downward. The dark horizontal line should follow the mouse pointer. When the mouse pointer is below the row of column headings in the worksheet release the left mouse button. A horizontal split bar should appear in the worksheet where the mouse button was released. Above and below the split bar should be two copies of the worksheet. There should also be two vertical scroll bars on the right side of the screen. Use the two scroll bars to position the data so that the column headings are visible above the split bar and the rest of the data below it. The position of the split bar can be changed as often as needed. Click on the split box on the right-hand side of the screen and drag it back to the top of the worksheet. Click on the View > Split icon to turn off the split screen feature.